PASCAGOULA, Miss., May 31, 2012 (GLOBE NEWSWIRE) -- The U.S. Navy today awarded Huntington Ingalls Industries (NYSE:HII) a $2.38 billion fixed-price-incentive contract for the detail design and construction of the multipurpose amphibious assault ship Tripoli (LHA 7). The ship will be built at the company's Ingalls Shipbuilding division. "Large-deck amphibious ship construction is an important component of our business plan, and we are pleased to have reached agreement with the Navy on this contract," said Ingalls Shipbuilding President Irwin F. Edenzon. "We are also pleased to continue providing such an important asset to the sailors and Marines who are being called on to perform an ever-increasing list of tough missions. Ingalls shipbuilders understand the importance of building these ships safely and efficiently while all the while focusing on delivering a quality product. LHA 7 will be a great ship built by great shipbuilders." LHA 7 and LHA 6 are the first two ships in the new America class of amphibious assault ships. Tripoli will be 844 feet long and 106 feet wide and will displace 44,971 long tons. The fuel-efficient gas turbine propulsion system will drive the ships in excess of 20 knots. She will accommodate 1,059 crew (65 officers) and 1,687 troops. She will be capable of carrying a Marine Expeditionary Unit, including Marine helicopters, MV‐22 Osprey tiltrotor aircraft and F‐35B Joint Strike Fighter (JSF) aircraft. "We have an excellent build plan in place for LHA 7, and we will continue to develop fresh ideas through the knowledge and experience our shipbuilders have in large-deck construction," said Brian Cuccias, Ingalls' vice president, large deck amphibious ships. "The multi-mission capability of these ships has been proven in the fleet, and LHA 7 will further the technological advancements set forth by previous ships." 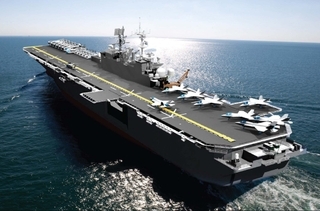 Like the future USS America (LHA 6), LHA 7 has an increased aviation capacity to include an enlarged hangar deck, realignment and expansion of the aviation maintenance facilities, a significant increase in available stowage for parts and support equipment, and increased aviation fuel capacity. Similar to its predecessors, the ship will be able to operate as the flagship for an Expeditionary Strike Group. Ingalls has built five Tarawa (LHA 1) class ships as well as eight Wasp (LHD 1) class ships. The first of the America class (LHA 6) is currently under construction and is scheduled to launch in June. Tripoli will be the third ship to bear the name which commemorates the capture of Derna in 1805 by a small force of U.S. Marines and approximately 370 soldiers from 11 other nations. The battle, memorialized in the Marines' Hymn with the line "to the shores of Tripoli" brought about a successful conclusion to the combined operations of the First Barbary War.